Copperhead is a master contortionist with amazing muscular control. 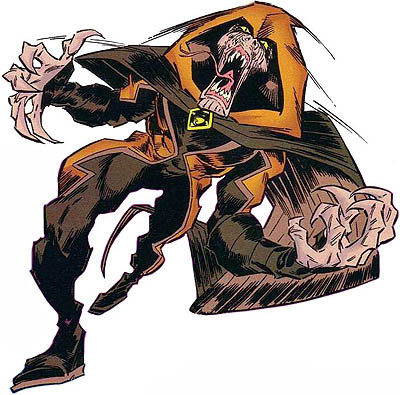 Copperhead initially wore a costume that gave him his abilities until he made a deal with the demon Neron, who mutated him so he has an actual serpentine form. His powers are now a part of him. He is able to deliver his venom with a touch now. Costume: Copperhead has a costume with a silicon-like coating that aids him in squeezing through small or narrow openings. The costume is woven from experimental metallic and elastic fibres, and is partially bullet proof. An artificial tail that could be stretched, coiled and constricted around opponents was built into the costume, and artificial fangs in his helmet were coated with toxic venom. Nothing is known about the early life or origin of the criminal known as Copperhead. He first showed up in Gotham City several years ago where he committed a number of rapid-fire thefts before Batman and Batgirl eventually apprehended him.